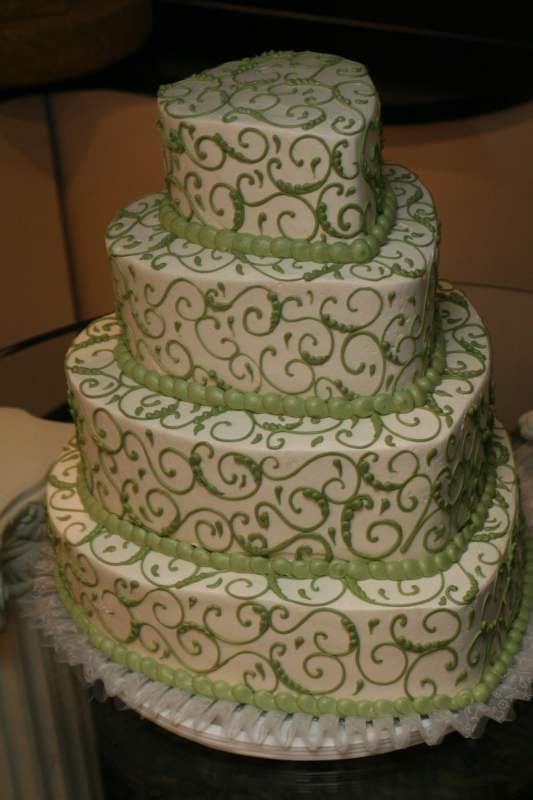 Ontario Bakery: wedding cake pictures: Two peas in a pod? wedding cake pictures: Two peas in a pod? A bride-to-be with a green thumb may appreciate this wedding cake, inspired by the pea patch, with tendril-shaped flourishes framed by green beads of buttercream evoking peas in their pod. We baked the cakes in the shape of leaves for a unique design. This cake is a lovely way to bring joyful country style to your wedding celebration, to accent a spring green wedding color pallette, or celebrate a shared interest in gardening. Definitely a winner for a gardening bride and groom who are two peas in a pod...but wouldn't something like this also be cute for a baby shower? Come into our bakery to see more of our styles and taste the flavors that most intrigue you. And don't forget to find us on Pinterest where we have shared many wedding cake pictures for your planning inspiration. Wedding cake flavors...have them all!